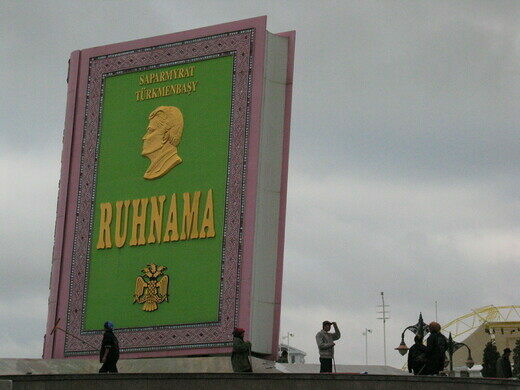 The Ruhnama is something of a manifestation of the personality cult of the longstanding Turkmen president. He wrote the Ruhnama (The Book of the Soul) in 2001 as a spiritual guide for the Turkmen nation, and as an attempt to “Turkmenize” the country. The Ruhnama features a weird combination of revisionist history, moral ideals, religious norms, and fairytales. The first volume was issued in 2001, and a second volume was published three years later. Niyazov ordered that reading the book was mandatory at all schools and universities, and that all new government employees should be tested on the book’s contents. He later even made a test on the Ruhnama an essential element of driving tests. Niyazov was once quoted saying, that God himself told him that everyone who has read the book would come directly to heaven. Often compared to Gaddafi’s infamous Green Book in Libya. Since its publishing, the Ruhnama has largely been met with amusement outside the country. Generally seen as an excellent example of the weird, totalist nature of Turkmenistan’s regime, the book shows the country’s bizarre closeness between the state and the head of state. Even Niyazov’s death in 2006, has not put a damper on the popularity of the book in the regime, and Niyazov’s successor still regards the Ruhnama as an essential part of Turkmen heritage. Despite its strange nature, the book has been translated into several languages, mostly sponsored by foreign companies that received large-scale contracts in return. 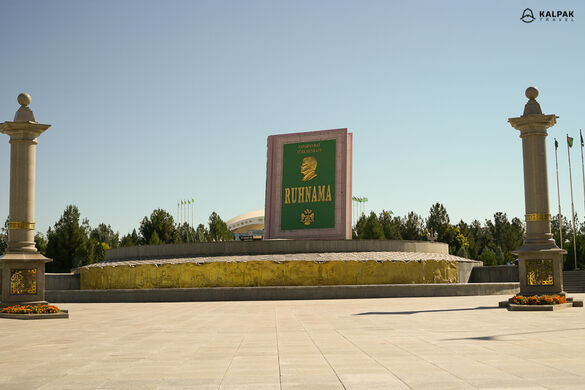 The Giant Ruhnama is but one of the many weird outcomes of the personality cult of Niyazov, which has turned Ashgabat into one of the most politically bizarre places on Earth, adorned with golden statues of the dictator and freed of all “non-Turkmen“ elements, such as theaters. 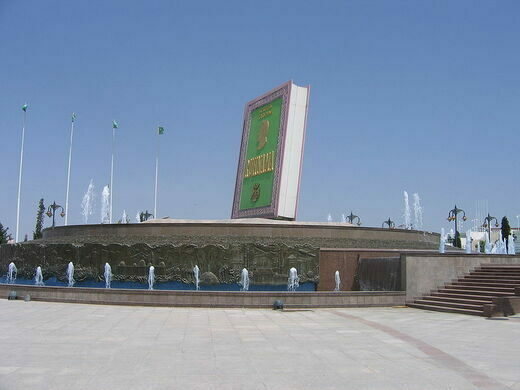 As of now, Niyazov is the only author self-conscious enough to have created a giant monument to his fictitious work.